Mar. 20, 2019: Meet Simone, a six-year-old white female kitty with the tiniest spot of gray just below one ear. Her stunning chiseled face makes her look regal and delicate all at the same time. Simone is a total love. 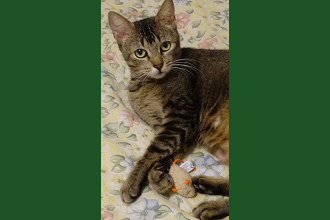 This easy-to-handle lady is great with people, dogs, and other cats and is completely litter-box trained. Her favorite party trick is giving head-butts, and she will spend her day chatting away to anyone who will listen. Simone has shiny green eyes and an adorable pink nose. 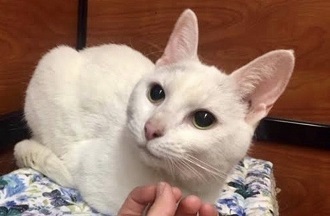 One of the most common issues with white cats is that they can often be deaf because the gene that causes deafness is linked to the coat color white. Thankfully, this is not the case with Simone. An interesting fact is that a cat with blue eyes is the most likely to suffer hearing loss. White cats with green eyes, like Simone, are usually of the Persian, Russian White, Asian, and Norwegian Forest cat breeds. Simone has been spayed and is up to date with her vaccinations; she is as healthy as can be. If you would like to meet her, please fill out an application on the Posh Pets Rescue website at http://poshpetsrescue.org/applications/. Adopt a Pet--Save a Life!